I made 6 IAP (Instrument Approach Procedure) charts for Balkans theater for Falcon 4.0 Allied Force . Airports that covered are : Crotone , Grosseto , Pescara and Rimini in Italy , Pula in Croatia and Ljubljana in Slovenia . 2) In order to have a perfect alignment with runway centerline and because of fact that the last waypoint has a decimal digit , you must insert GPS coordinates of TACAN station over a steerpoint , so you can turn to final approach course aligned with runway centerline at exactly DME of last waypoint . Most excellent! Very nice contribution to the community. KUDOS! Perfect work eystratiou. It looks cool and profi. Shame I did not practise such a landings in the sim. It reminds me I tried to land in almost zero visibility once. Aproached for five times using just waypoints- runway was besides me a little in all cases. Then I saw redemptive cargo plane going to land. So i "stucked" to him and landed finaly with 100 lbs of gas. BTW: I want to open a topic about "how to setup a fully featured airbase in F4 AF". I am a newie in it, just studied stations.dat file in the wiki a little. Do you know all the necessary files and relations among them? I suppose so, just because you had to harverst the info for your pictures somewhere. Luk wrote: BTW: I want to open a topic about "how to setup a fully featured airbase in F4 AF". I am a newie in it, just studied stations.dat file in the wiki a little. Do you know all the necessary files and relations among them? I suppose so, just because you had to harverst the info for your pictures somewhere. From file "stations.dat" you can get TACAN channel , TACAN range and ILS localizer frequency of each airport . 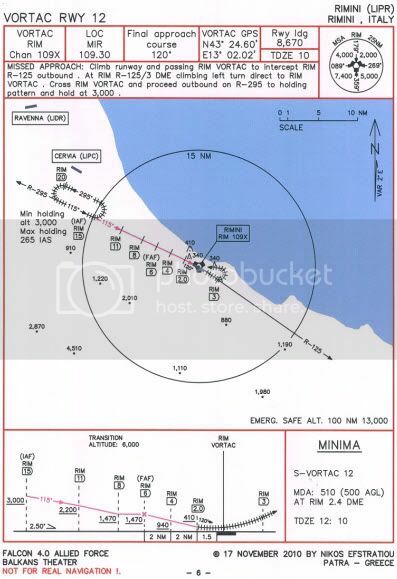 Inside the "BALKANS_IAP_CHARTS.zip" file you can find the "Tacan list Balkans Falcon4 A F v2.0.pdf" file that contains all the above data plus runway orientation and runway elevation for all airports of Balkans theater . What other info you want ? The bottom part of the picture you have posted is very interesting for me. There is something as section/flight profile- different highs in various distances from an airport. Is it always the same for all airbases of the same type? Or is it editable somewhere? It could be editable in both planes ideally (horizontaly and verticaly). Luk wrote: The bottom part of the picture you have posted is very interesting for me. There is something as section/flight profile- different highs in various distances from an airport. Is it always the same for all airbases of the same type? Or is it editable somewhere? The bottom of the picture is a section/flight (profile) . It isn't the same exactly for each airport (based on real procedures) even for the same type airports . Now the pictures are not editable , i made them via AutoCAD so they are under scale , then i print them and last i scan them to jpg . If you want to check some real IAP charts , just go to : http://dtpp.myairplane.com , and select a State and then an airport and last a chart that starts with IAP . I hope to help you a little . Thanks for the answer eystratiou. So it is for human multiplayer only I guess. Ok. I thaught the profile is grabed from some Falcon file and AI pilots are flying that way. That's why I asked if the path is editable in F4. Luk wrote: Thanks for the answer eystratiou. Each chart is made from scratch and is based on real procedures , so it is unique for each airport . The distance and the altitude of each point is calculated by specific method and then drawing to the chart . So the profile (and all the chart) is created by me from scratch and not with grab something from Falcon files . These charts are for use by any Falcon pilot (single and multiplayer pilots) who fly at Balkans theater of Falcon 4.0 Allied Force .